In the early New York fall, we take a closer look at four exhibitions in Chelsea, all of which are in different ways dealing with humans' perception of their immediate environment, and to some extent with the fragility of being. 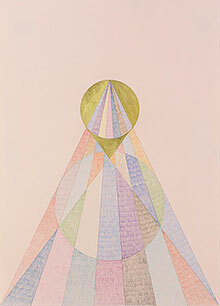 Berlin-based artist Claudia Wieser has her installation The Mirror on show at Marianne Boesky. The title is borrowed from Tarkovsky's film from which it takes inspiration. Like Tarkovsky, Wieser freely breaks apart time and space, and shifts between complementary visual expressions in two as well as three dimensions. Large reproductions of ancient Greek artifacts from old books parallels Tarkovsky's use of re-filmed TV screens in order to reposition the spectator. Paintings and drawings along the wall illude scientific charts and symbols. The misaligned mirror fragments draws upon archetypical symbols of a disintegrating world view, as known from five thousand year old Yoga Sutras, and create an image for a world misunderstood through the filter of the mind. 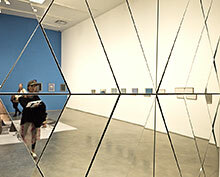 The installation balances on a thin line between the real and the deceptively real. The experience is swinging between the fog of dreaming, and the perceived lucidity that sometimes precedes a psychological breakdown. Gallery hours: Tue - Sat 10 am - 6 pm. 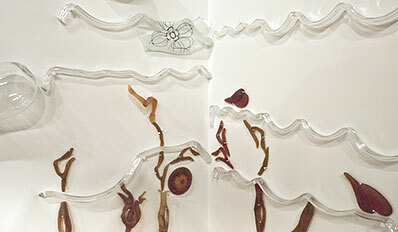 Between Seeing and Knowing, by glass artists Anna Boothe and Nancy Cohen, builds on related philosophical goods. On show at Accola Griefen Gallery, it is an interpretation of the Tibetan Buddhist tradition of Thangka painting, for which the artists share an interest. Like the creation of Thangka painting is a communal work, with little interest for the artist's identity, Boothe and Cohen work separately in their respective studios, and merge their unsigned components into a complex unit. The piece is a very free, not to say far fetched, interpretation of the Thangka tradition. It is an impressive technical achievement, with its manifoldness of methods for manipulation of the glass. The many small elements consist of kiln-cast, blown, fused, and hot-sculpted glass, relating to how Thangka consists of several techniques of painting and embroidery. The piece demands and rewards knowledge, and it takes some work to digest the concept. Accola Griefen, 547 W27th Street, 6th floor. 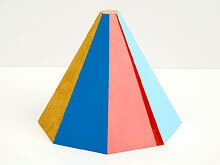 Gallery hours: Tue - Sat 11 am – 6 pm. 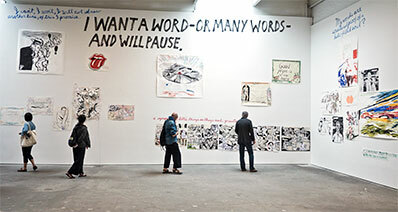 Not too different in its installation, although in larger scale, different media and attitude, is Raymond Pettibon's To Wit at David Zwirner. Here, we find mostly ink drawings on paper, with esthetics sometimes borrowed from the world of comics, sometimes more classic in style. 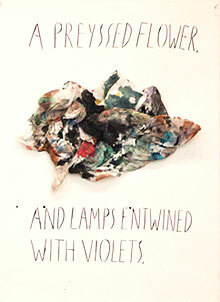 This is mixed with text, wandering from the paper out to the wall. 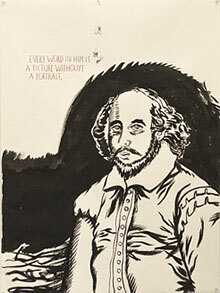 The plentiful references also build on classic literature and art as well as popular culture. Originally from Arizona, the artist reached his broader audience in the punk rock world of California. 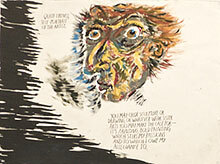 He is forever associated with his brother's band Black Flag, whose album covers and show posters originate from his pen. The coherently rough, formally unschooled ”do it yourself” esthetics, with a cheerful, mild rage survives surprisingly well in the gallery's white cube environment. Sportsmen, genitalia, and cultural celebrities serve as icons of the threadbare dream of modern America. Taboo lines are crossed, and the artist laughs together with the spectator at it all. Gallery hours Tue - Sat 10 am – 6 pm. 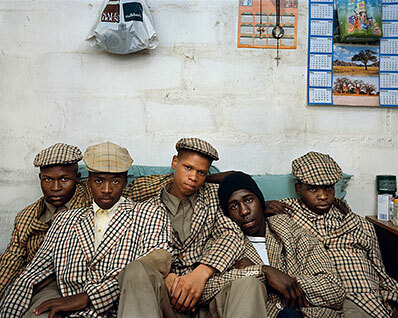 A different type of societal commentary comes from South African photographer Pieter Hugo at Yossi Milo Gallery. After some time of extensive traveling through Africa, Hugo has now aimed his camera to his immediate environment, in a society that still lives with the ghost of Apartheid. The exhibition consists mainly of portraits, but also of landscapes and still lifes. Among the portrayed are his own newborn child, an elderly man with a Keith Richards expression, a bi-ethnic couple standing naked on a beach. The gazes are often harsh and defensive, tired, but ready to once again fight for their right. The photographs are painfully sharp, also in a photographic sense, but mainly regarding the expression that over and over confronts the spectator. Hugo lets the portrayed people to an unusual extent be the subject, questioning those whose gaze they meet, and their responsibility in an unfair world. The photographs show conditions impossible two decades ago, but even more it shows the fragile foundation of the present order. Gallery hours Tue - Sat 10-18.